Kissed by the Moon is offering our readers a giveaway of an Itti Bitti Tutto One Size Diaper, a value of $26.95. Itti Bitti Tutto One Size diapers are beautiful and plush diapers with customizable absorbency and a patented “poo fence” to keep messes where they belong: inside the diaper! Kissed by the Moon is a family-run cloth diaper and natural parenting online store. 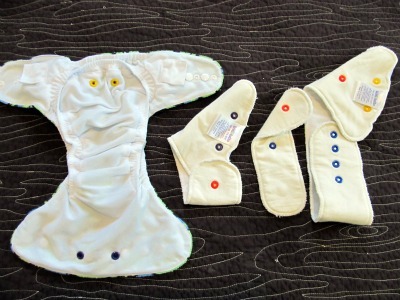 In addition to an impressive selection of cloth diapers, Kissed by the Moon offers a variety of diapering accessories, laundry products, wool care, and various other items consistent with natural parenting. When I first laid eyes on the Itti Bitti Tutto One Size Diaper, I was struck by what a beautiful diaper it is. The Ponder print that I received looked exactly like the website photo; the colors were vibrant and accurately depicted. This diaper didn’t just look good, it felt good! The outer shell is plush and soft, as are the soaker inserts that come with it. 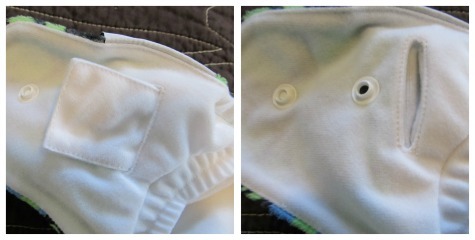 The fabric and construction are high quality, and I have no doubt that this diaper will withstand the test of time. I started to explore the size range of the diaper and was especially impressed with how small and trim the lower end of the size range was. I had a six-pound newborn, and we tried numerous one-size diaper options struggling to find one that would work on her petite body. I am confident that the Itti Bitti Tutto would have fit her much earlier than the other options that we tried, and at 2 years old, the diaper still fits her perfectly with the rise fully unsnapped. That said, she is still very petite, so bigger and taller toddlers would likely outgrow this diaper before they’re out of the diapering stage. As I experimented with the diaper, I was somewhat overwhelmed by the three soaker inserts. While the snaps are color-coded and the packaging includes diagrams for assembling various combinations to customize absorbency, it took me a fair amount of trial and error to find the ideal combination for us. This process was further complicated by playing around with the rise settings, as the inserts had to be adjusted when I adjusted the rise. A friend of mine happened to make a comment about how much she loves Itti Bitti Tuttos, and when I mentioned that I found the inserts confusing, she was surprised and said that the color coding made perfect sense to her, so the learning curve is certainly not insurmountable! The first time I put the diaper on my daughter, I was easily able to get a comfortable fit. The diaper fit snugly, but without leaving any marks on her skin from the elastic or snaps. I especially love the built-in hip-snap covers with their own little pockets to tuck them into when the hip snaps are needed! A minor drawback of this diaper is that the snaps seem particularly easy for toddler fingers to undo. Within seconds of putting the diaper on, my daughter quickly undid the snaps and pulled it right off. This would not be an issue with younger babies, and for us, it simply means that this is a diaper reserved for wearing under pants so she can’t get to the snaps! Overall, I was very impressed with the quality and function of this diaper. 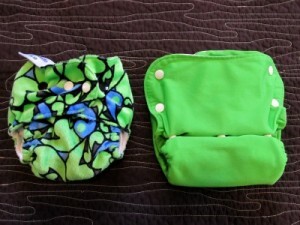 The Itti Bitti Tutto is an excellent one-size diaper option for parents with petite babies who don’t want to wait for their little ones to grow into the other one-size options. The built-in hip-snap covers and “poo fence” are nice additions to this diaper, and the absorbency is top-notch. Even without fully prepping the diaper, we had no leaks! There’s a bit of a learning curve with the inserts and snap settings, so I would recommend this diaper for parents who either have a fair amount of experience with cloth diapering or a lot of patience to work through the learning curve. You can purchase your own Itti Bitti Tutto One Size Diaper at Kissed by the Moon for $26.95 in a variety of colors and prints. Kissed by the Moon offers free shipping on all orders! And just for Natural Parents Network and Fine and Fair readers, Kissed by the Moon is giving a 10% discount on all orders from now through May 31. 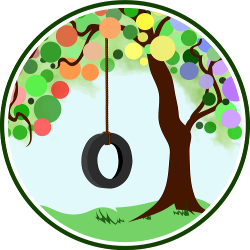 Enter code NATURALPARENTS during the ordering process. For your own chance to win an Itti Bitti Tutto One Size Diaper from Kissed by the Moon, enter by leaving a comment and using our Rafflecopter system below. 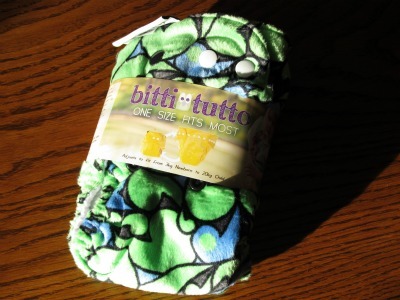 The winner will receive one Itti Bitto Tutto One Size Diaper in the color or print of their choice. Contest is open to the US & Canada. MANDATORY ENTRY: Visit Kissed by the Moon and tell us which color or print you would choose if you won! You must enter your name and email address in the Rafflecopter entry system for your entry to count, after leaving a comment on this blog post. Contest closes May 14 at 11:59 p.m. Eastern Time. and some links are affiliate links. Joella works as a Parent Coach and Substance Abuse Counselor, and blogs at Fine and Fair about the journey of raising her daughter as a responsible citizen of the world with the values of compassion toward all living things, environmental responsibility, conservation, and celebrating diversity in all of its forms. Ayannah is the print I love! Jade and Galaxy are both gorgeous! I would choose Red or Galaxy. I think I would pick fuschia or zebra, I love them both so much! If I win I will pick the Danube print! SO cute!! I would pick the Danube or Ayannah print. They are both too cute! Such fun prints! I’d pick Ayannah or Eton.